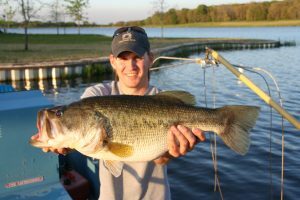 Fishing – We’ll conduct a comprehensive lake survey to analyze current conditions and customize a successful management strategy. We oversee ponds from one to more than one hundred acres. Bob can guide you from anything to improving a catfish hole to developing a comprehensive, long term, diverse plan from managing key fishing lakes to guiding smaller bodies of water to producing fish to enhance those key lakes. Wildlife—Need assistance planting wildlife food plots or improving habitat? Want to attract birds and wildlife to viewing areas? Ever created a hiking trail to observe Nature? Bob Lusk has the vision and the network of people to make these dreams come true. Property and Infrastructure—looking for ideas for your perfect cabin getaway…or that big lodge you’ve dreamt of? 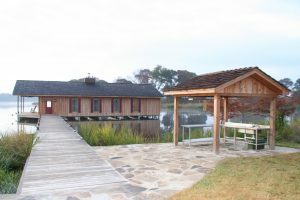 Want a boathouse with a fishing pier? Need assistance with road improvements or general building maintenance? Ready to install that long-planned dock? We have layouts for a cabana to host shoreline cookouts. Ask about floating islands that offer great landscape appeal and baitfish habitat. Imagine statuesque cypress trees in the water’s edge! Bob Lusk understands the value and need for infrastructure and has the vision to help you complete your dream property. He’s helped design many, many amenities. Equipment—So, you have the perfect lake with great fish. But, there are so many pond things out there…what should you buy, what to avoid? Want a boat, but in today’s world, there are literally hundreds from which to choose. Jon boat, fiberglass, aluminum, kayak, canoe…one man, two man, electric engine, gas engine? What about gear? Rods and reels…learning how to fish? Bob Lusk can help. You’ve just purchased your dream property. Maybe it’s a weekend cabin or retirement home to share with family and friends. Perhaps you’ve owned a place for a while and are ready to create a plan for developing property potential. Maybe you’ve gone back home…to the family land and it’s in your soul to restore its resources to former glory. Or, you’ve shopped for months, maybe years, and have found the property of your dreams. You want to do things right, but aren’t quite sure what can be, or should be, done. You need help with it…before you sign that dotted line. Over there…a beautiful pond. You occasionally see ripples on the surface and wonder what’s in it. There may not be a pond and you’re anxious to build one. On the ground, beneath your feet…you see wildlife tracks and wonder about hunting opportunities, or what critters frequent your place. Our passion is you! Teaching you how to be the best steward of your land and water is our mission. Helping lake and property management services guide you to achieve your lofty goals is what we do best. Sure, we promote water quality and healthy critters. Absolutely, we can help get your lake or pond to reach its best potential. Our commitment is helping maximize enjoyment of natural resources around your property while using best methods of stewardship. Contact us to learn more about our lake and property management services.